The sixth story in Fantasmagoriana, ‘Le Revenant’ / ‘Der Geist des Verstorbenen,’ is the first story not to be translated in Tales of the Dead. The ghost motifs in this story do not excite much horror and terror and appear to have had no influence on Frankenstein. 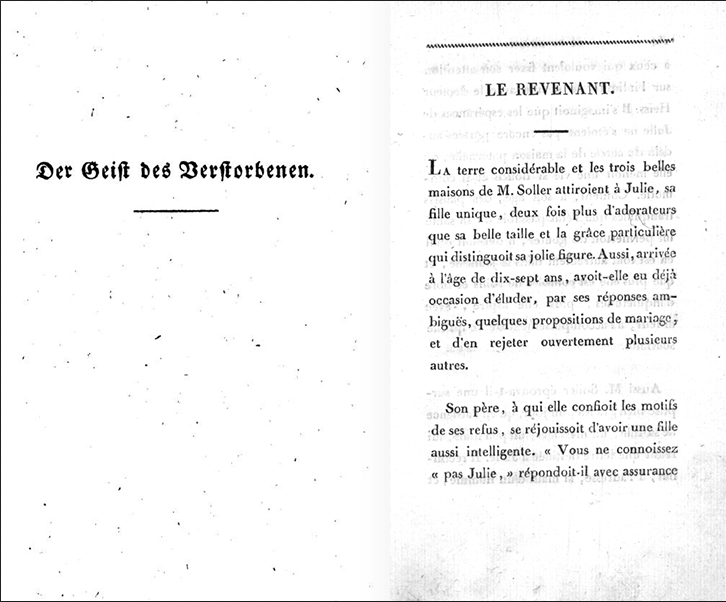 First, the provenance path from the German source to the French translation. This Schulze story—literally translated as ‘The Ghost of the Deceased’—centers on the themes of love and loss in the middle class. The ghost-seeing is logically debunked in the story and functions as a plot device rather than a motif for horror and the supernatural. 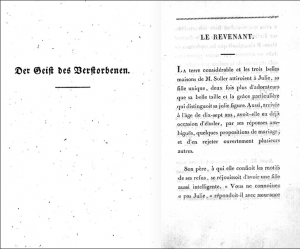 Eyriès translated the title as ‘Revenant’ to signify both an ‘apparition’ or ‘phantom,’ as well as a person who is not expected to be seen again, or who perhaps returns as a ghost. This translated title plays accurately on the main plot and themes of the story. The plot revolves around Julien Soller [Julie in the French translation]. Julien falls in love and wishes to marry Dr. Gustav Hess [Heiss in the French translation]. When Hess formally asks for her hand in marriage he is denied. Since his illness, Julie’s father has developed the ability to see ghosts. 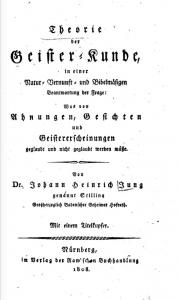 Reading Doktor Jung’s System der Geisterwelt [The System of the Spirit World], he has learned that people who show their ghost during their lifetime must have a suspicious character. Believing he has seen the ghost of Hess, Soller is against the marriage. Shrewdly, Julien convinces her father of the falsehood that he actually saw the real Hess, not his ghost, because she had let Hess in the house late at night. Her father is convinced and agrees to the marriage. Eight days before the marriage, however, Soller sees the ghost of Hess again. He wants to cancel the marriage. Due to the social scandal this would cause he has no choice but to agree to the marriage. He refuses, however, to witness it. Hess gives up his medical practice and the two newly weds profess their love for one another. Following a story of two lovers who promise to remain true to each other even in death, and to be mindful of this promise until the deceased returns, the newly-wed couple feel that their love is true and that they cannot be separated by death. Over time their promise is forgotten and after two unsuccessful pregnancies the couple grow apart. After three years their union is an unhappy one. Hess travels without Julien to their usual summer-repose at the baths. From her husband’s brother, Julien receives a note that her husband had fallen ill, followed shortly thereafter by a second note that he has died. She falls ill, recovers, and visits her husband’s grave. Then, shortly afterwards, her father becomes bedridden. Julien’s loving care in nursing her father does not go unnoticed and she receives the attention of many suitors—which she rejects. Thus, after her father succumbs to his illness ten months later, she remains a widow and finds herself quite alone. Julien nostalgically thinks back to the first weeks of her marriage. She fancies she sees her husband in her bedroom. Convinced it was his ghost she comes to understand her father’s visions. On one occasion she clearly sees the scar on her husband’s cheek. Convinced of his ghost, she speaks openly about her ghost-seeing. Her story is even published without mentioning her name. At a social gathering she meets a friend of her husband, Herr von Rosen [M. de Rosen in French translation]. The two become friends over ongoing discussions about her ghost-seeing. Herr von Rosen is a persistent doubter of ghosts and contradicts Julien’s seeing of her husband. Discussing the circumstances of her husband’s death, von Rosen then presents the hypothesis that her husband had wished to go on a long journey. Given their disharmony, they could not have gone together, and he did not want to ask her for a divorce. In this scenario, Hess solved his marital problem by faking his death. As a doctor, he was able to substitute the body of a dead patient he had been caring for; the face of the deceased patient being disfigured and thus being covered with a cloth for the visitation. Julien questions Rosen’s scenario who parries her skepticism with logical explanations. 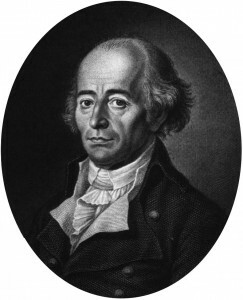 He then continues his narrative suggesting that over time Julien’s image makes impressions on her husband’s heart and his longing drives him back home. Upon his return, he only wishes to see that Julien is well. He finds a way to visit her bedroom and is mistaken by Julien for a ghost. Julien regrets this is not the truth and dismisses these claims, remaining convinced that her husband is dead and that she had seen his ghost. Von Rosen continues his logical explanations. In presenting his hypothesis, he is preparing Julien to accept the possibility that her husband is still alive. After further events and debates von Rosen finally asks her what she would do if her husband came out of the next room. Would she believe his hypothesis and explanations then? The door opens and Hess and Julien are reunited. Hess would never have risked such reunification if it had not been for the publication about Julien’s ghost-seeing which convinced him of her devotion. To avoid scandal, Julien sells her belongings and the couple move elsewhere under the name Hess had adopted after faking his death. Schulze’s story does not appear to have had any influence on Frankenstein. While it plays with the device of ghost-seeing, the story suspends all impressions of horror and terror. In particular, von Rosen’s detailed hypothesis debunking the existence of ghosts shifts the thematic focus towards the endurance of love and devotion of the couple. Not surprisingly, therefore, the story did not leave an impression on the Byron-Shelley circle and especially, the composition of Frankenstein. The next blog will focus on the seventh and eight stories in Fantasmagoriana: ‘La Chambre Grise’ and ‘La Chambre Noir.’ These are companion stories so we will examine them in tandem because, as we shall see, they share an intertextual relationship.